A stomach virus can make it difficult for you to eat. Foods that are bland and easy to digest, but still provide a bit of nutrition are what you should eat with stomach flu. When people say you have the stomach flu this means you are suffering from gastroenteritis or inflammation of your intestines and stomach. This can be caused by bacteria, viruses, drinking spoiled water, eating spoiled food or specific dietary issues like lactose intolerance. Influenza refers to a specific viral infection that has cold-like symptoms along with fatigue, respiratory congestion and fever. There are over 100 types of viruses that can cause a cold, but only influenza A, B and C can cause the flu, though conditions associated with this disease can lead to other illness like pneumonia. There is no medication that can treat influenza because it is spread through a virus but not bacteria. When you have the stomach flu you are very susceptible to dehydration. You should aim to drink around 200 mls of water every time you experience diarrhea in addition to any fluids you would drink normally. In general, adults are recommended to drink around 2 liters of fluids per day. If you are throwing up, wait a 5 to 10 minutes before drinking anything else and only take a sip every 2-3 minutes to avoid making yourself ill again. If you are already dehydrated, your doctor will tell you how much to drink or can recommend proper rehydration drinks that can help you restore the nutrients you are losing. Soup can be helpful when you are trying to treat dehydration. Plain broth-based soups or soups that have soft ingredients like pasta, beans or vegetables that are easy to digest are best. Don't drink beverages that have a lot of sugar as this can aggravate your diarrhea. If you require a rehydration beverage, get one from your doctor instead of trying to make one at home. Homemade rehydration drinks will not have the exact amount of sugar and salt you need to be effective. Also avoid any beverages that cause dehydration such as caffeinated beverages or alcohol. Creamy soups that do not contain dairy can be soothing for the stomach as well. Make sure the soups you choose are seasoned mildly with no spicy elements or pungent herbs that can cause irritation. When it comes to what to eat with stomach flu, the options are quite limited. Clear Liquid Diet- People are encouraged to stick to a clear liquid diet for the initial 24 hours after developing the stomach flu. Stick to clear liquid foods like sports drinks, water and sugar free gelatin during this time. Caffeine-free sodas are acceptable if they are clear in color and have gone flat to avoid irritating the stomach. Watering down teas or apple juice can make them palatable during this time. Sucking on ice chips can help you stay hydrated. Consume these foods and beverages in small bites and sips, slowing down if you feel nauseated so your system can settle. Fruits and Vegetables- Eating plenty of fruits and vegetables can help you rehydrate while providing nutrition you might be missing on your limited diet. You can add vegetables to a broth-based soup to help increase the amount of antioxidants in your meals. This will help your body fight off the flu more effectively. 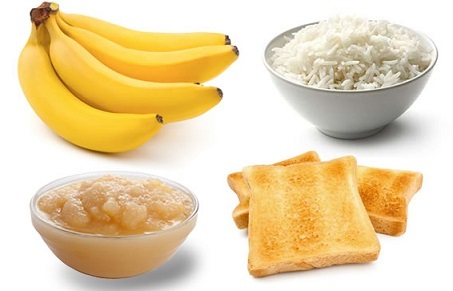 As your diarrhea becomes more manageable you can start eating things that are bland and soft like a potato or bananas. Unsweetened applesauce, peeled pears or apples in their natural juice, cooked carrots, fruits smoothies or steamed cauliflower are also helpful suggestions. Soft Grain Products- Grains can help you get more glucose into your diet. Items like rice, baked goods and breads can add fiber and protein to your diet, particularly if they are whole grain rather than refined grain. However, take it easy to determine if you can digest these whole grain items to make sure the added fiber is not contributing to your diarrhea. Until you have recovered more fully, stick to bland grains like rice or enriched white bread that are soft and easy to break down. Hot barley soup, couscous, hot cereal or enriched pasta are also good choices. Foods that contribute to your discomfort or those that are aggravating to your symptoms should not be eaten while your body is trying to recover. Anything that is very fatty, spicy, acidic or fibrous should not be eaten. Avoid meats, coarse vegetables and gains as well as dairy products because these items are hard to digest and can put too much strain on your system. Besides knowing what to eat with stomach flu, also take into account the medications. You should not try to take medication until you have reached the later stages of the flu. Your doctor can provide you with anti-nausea or anti-vomiting medications if you are becoming dehydrated. Do not take over the counter aspirin or antibiotics while you are suffering from the stomach flu. These can kill off the good bacteria in the gastrointestinal tract which can make your symptoms worse. Children suffering from the stomach flu should get medication from their pediatrician. They may require probiotics that can help replenish the bacteria in their digestive system that is being killed off by the virus. Which Cold Medicine Is the Best for You?